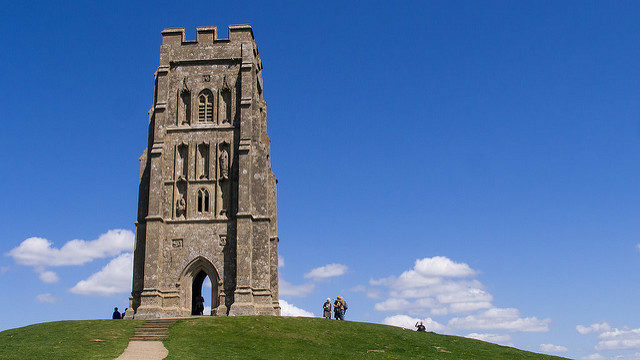 Glastonbury Tor is a conical hill in Glastonbury, England, which is topped by a 14th-century roofless St Michael’s Tower. 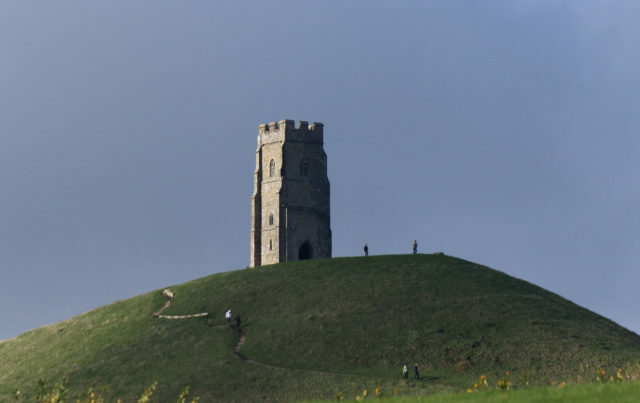 One of the most famous landmarks in Somerset, it is known as one of the most spiritual sites in the country. Excavations on the Tor have revealed some Neolithic flint tools and Roman artifacts, indicating use since ancient times. The terracing on the side of the hill, if man-made, may also date from the Neolithic era. 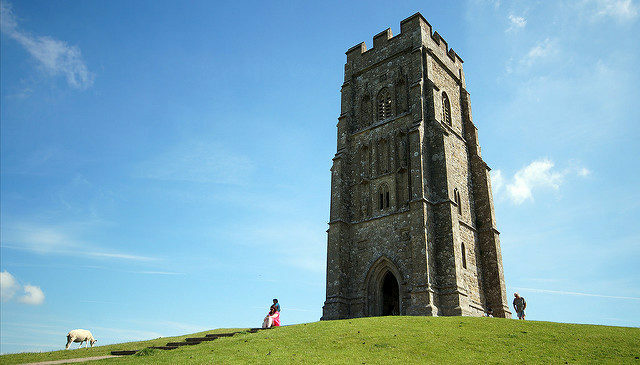 The first monastic Church of St. Michael that stood on Glastonbury Tor was probably destroyed in the major earthquake of 1275. 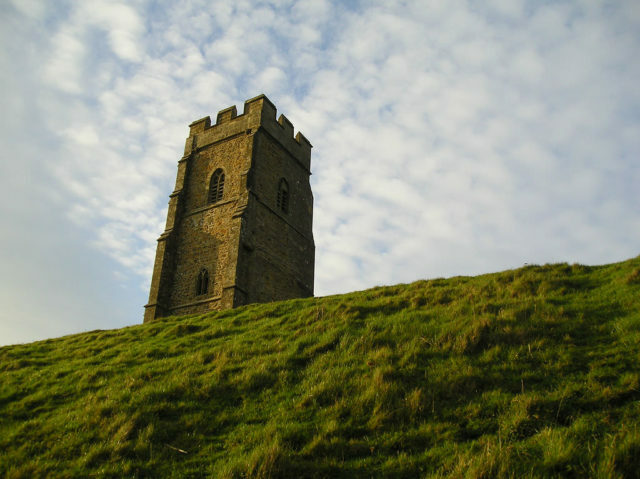 The church was rebuilt in the 14th century, and only the tower still stands today. Its pagan beliefs are still very much celebrated. 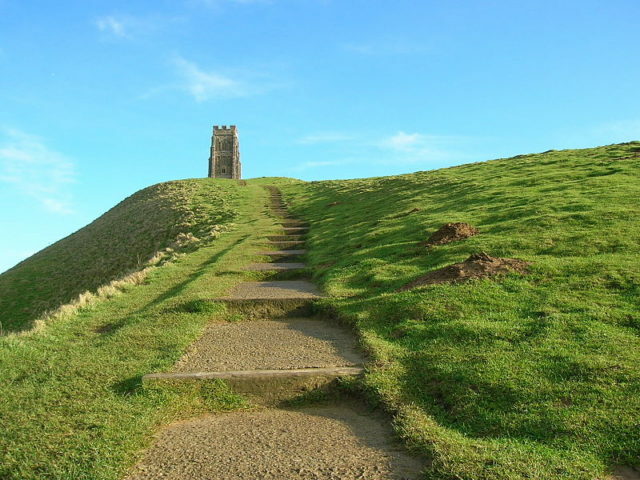 Rich in legend and mythological associations, Glastonbury Tor may have been a place of ancient ritual, and it was certainly a place of pilgrimage for Catholics in medieval times. 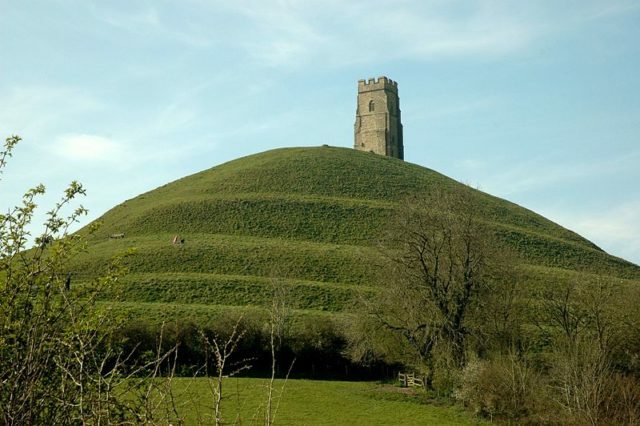 Since at least the 12th century the Glastonbury area was frequently associated with the legend of King Arthur, a connection promoted by medieval monks who asserted that Glastonbury was Avalon. 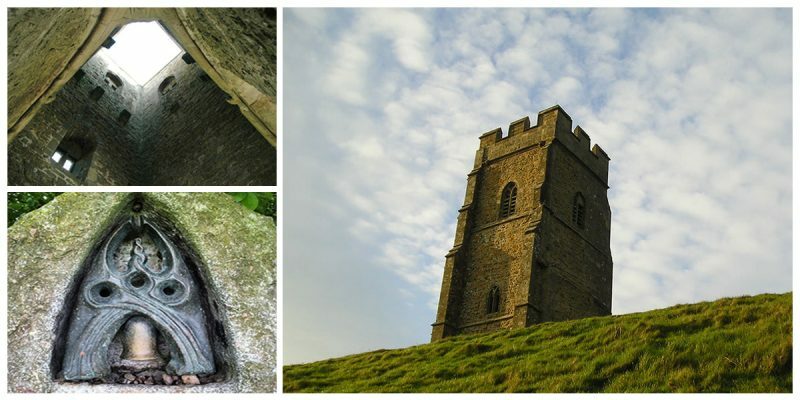 The Tor seems to have been called Ynys yr Afalon (meaning “The Isle of Avalon”), and identified with King Arthur since the alleged discovery of his and Queen Guinevere’s neatly labeled coffins in 1191, recounted by Gerald of Wales. 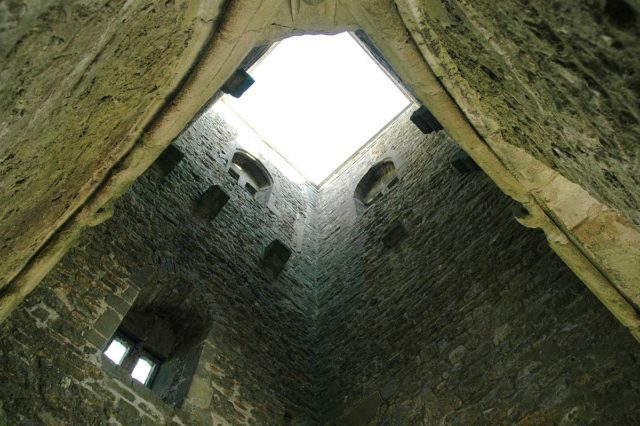 The remains were later moved and lost during the Reformation. 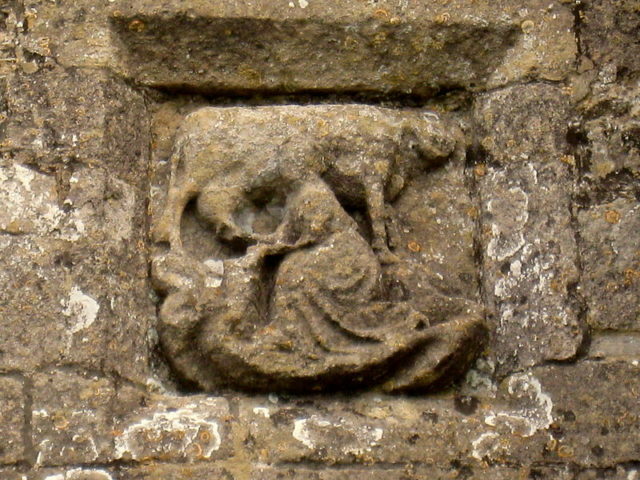 Many scholars suspect that this discovery was a pious forgery to substantiate the antiquity of Glastonbury’s foundation and increase its renown. The Isle of Avalon was considered the meeting place of the dead, and the point where they passed to another level of existence. The sides of the Tor have seven deep, roughly symmetrical terraces. Their formation remains a mystery with many possible explanations. One explanation is that they may have been formed as a result of natural differentiation between the layers of lias stone and clay used by farmers during the Middle Ages as terraced hills to make ploughing for crops easier. Other explanations suggested construction of defensive ramparts. Iron Age hill forts including the nearby Cadbury Castle in Somerset show evidence of extensive fortification of their slopes. 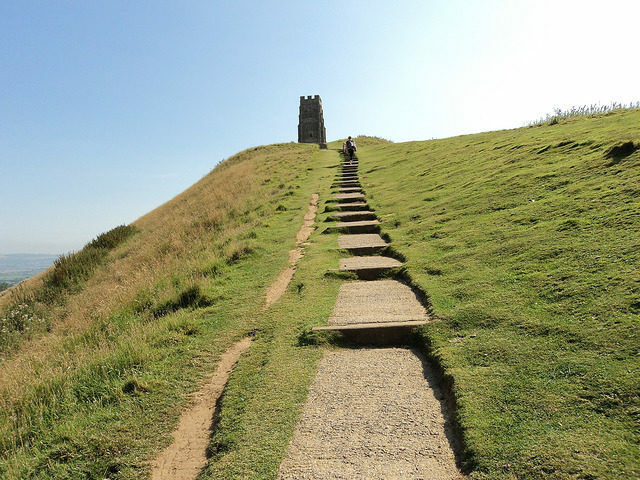 Another suggestion, proposed by Geoffrey Russell in 1968, is that the terraces are the remains of a three-dimensional labyrinth that guided pilgrims up the sacred hill. 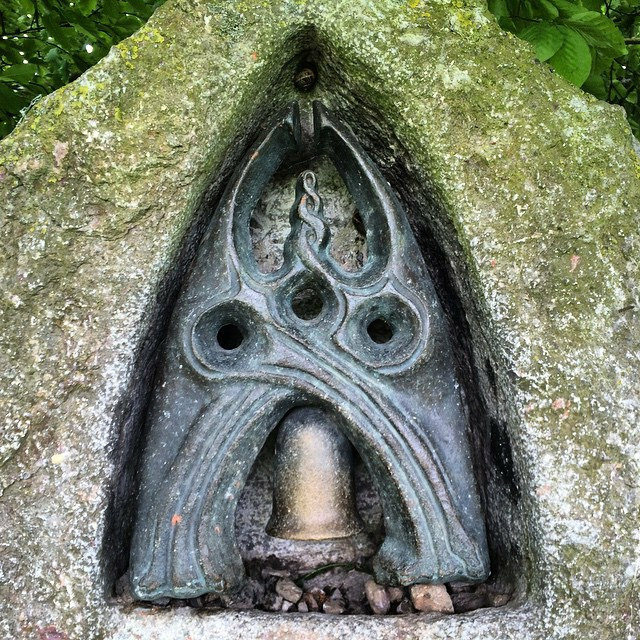 Archaeological excavations during the 20th century sought to clarify the background of the monument and church, but some aspects of their history remain unexplained.